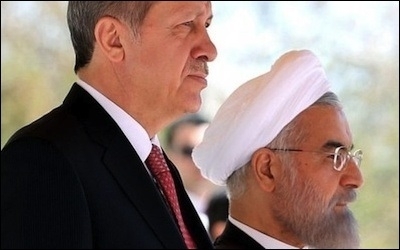 Turkish President Recep Tayyip Erdogan (left) with his Iranian counterpart in Tehran earlier this year. Ankara said that the deal 1) will contribute to the stability and economy of the region; 2) will have a direct positive impact on Turkey; and 3) must be put into practice with full transparency. Ironically, such a warm welcome from Ankara put Turkey into the same line as its worst regional nemesis, the Syrian regime of President Bashar al-Assad, who also welcomed the deal. "We are confident that the Islamic Republic of Iran will support, with greater drive, the just causes of nations, and work for peace and stability in the region and the world," Assad said in a message to Iran's Supreme Leader Ayatollah Ali Khamenei. Iran will have a stronger hand in supporting the Shiite war against the Sunnis in the Middle East. 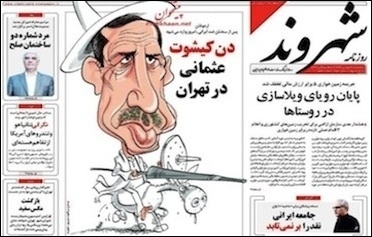 An April 2015 caricature in the Iranian daily Sharvand portrays Erdogan as an Ottoman Don Quixote. Iran should revise its regional policies and abandon sectarian politics ... It should revise its role in Syria, Iraq and Yemen ... It should play a positive and constructive role. It should abandon sectarian politics and give importance to political dialogue for solutions. This is our expectation from our brother Iran. After the nuclear deal, Turkey's sectarian war against Shiite dominance in the region will be harder to fight.